My younger sister forgot her computer login password and she asked me to help her out. I heard Ultimate Boot CD is a good tool to do that and made a bootable CD with the program. However, the password is still in there after reset. I tried 3 times with the same result. So please suggest a good alternative. I don't think that the UBCD has directly a provision to reset a Windows 10 password. You used the NT Registry boot disk on the UBCD? Anyway, we need to know the exact version of Windows 10 at hand. if you have a Windows 10 .iso. I have been using ntpwedit for years with success (latest version is 0.7). Build a winpe (any), "stuff" ntpwedit in there and you should be good to go. You can also use QuickPE to build your winpe. What is the difference between QuickPE and password reset disk? Edited by ministings, 04 November 2017 - 01:36 AM. A windows (Vista/7/8/10) install DVD boots to a (minimal) PE (Pre-install Environment). From it you can manually perform a number of steps that allow you to reset a password. 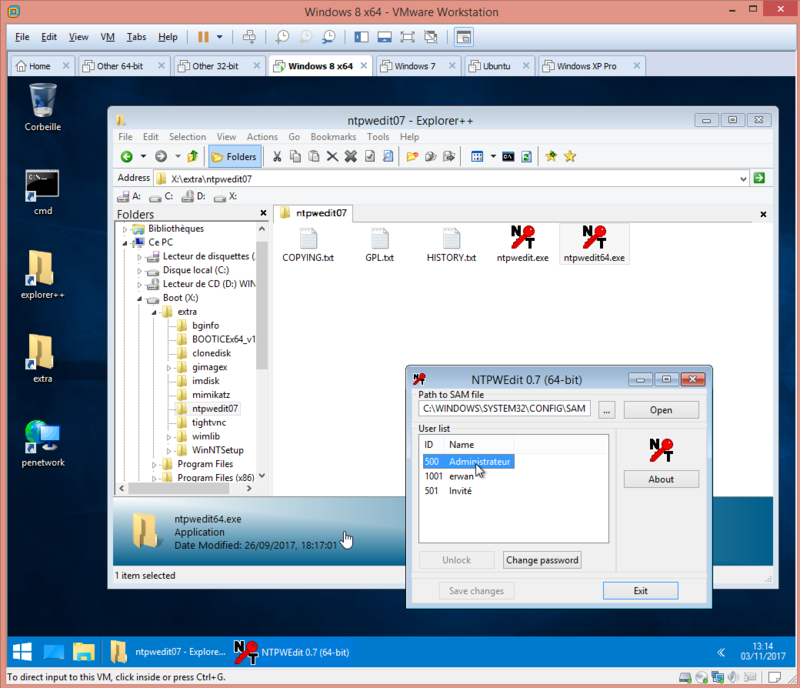 QuickPE is one (among a few) "builder" that allows to create (still starting from an install DVD/.iso) a slightly more "complete" PE, allowing in the process to add additional tools/programs (such as the recommended NTPWedit) that can provide the same ultimate functionality (resetting a password) in an "easier" way. The tradeoff is between the (minimal) complication of building a new PE and later having an easier password reset vs. using what you already have (the install DVD/.iso) and have a (slightly) more complex set of steps to perform the password reset. For a one time only use (and provided you already have an install DVD or can easily "burn" one from a .iso) I would go for the second, if you plan to create something that may come of use also in the future, the first is more advised (as it will constitute a "more featured" recovery environment suitable for solving possible future issues of different nature). The other proposed option of PassPass (if applicable) is slightly different as - it doesn't actually "reset" the password, but rather it "by-passes" it. Note : starting with windows 8.x, "fast startup" mode was introduced (an hibernation mode). Introducing changes (while offline) to your filesystem when windows is in "fast statup" mode is not recommended : at worse, you can corrupt your filesystem, at best your changes will be ignored. Workaround (quoting from another forum which I cannot reference) : "first boot to Windows and restart normally from the log in screen ( don't shutdown - restart and immediately boot to PE )". Latest NTPWEdit versions warns the user about this hibernation trick. have you tried ntpassword or ophcrack ? they're free and easy to use! i believe that even when using microsoft "online" account, there is a local account (at least an admin one).